The Fourth » It’s a Boy! Lurkin ears: still adorable. Not that we needed to confirm this. Good luck with the paper! this was a wonderful start to my birthday, it put me in such a good mood! thank you! Oh, happy birthday! I’m glad to have given you a present! Yeah, pretty much. Their ears may grow a little bit, but nothing compared to the rest of their body. lol. but NO. baby skarva, derk and floyd is not convincing. Your shading techniques are becoming really advanced! PPS symbols say “!! !” all the time >:) HA! Not convincing, as in you don’t think that’s what they looked like when they were babies? OR you’re not convinced you want to take care of a little creature that can’t control its bowels OR magic? Have to say, I’m disappointed that there’s no angry baby Blank attempting to whack Skarva with a gold-painted rattle. Babby Skarva is the cutest thing! He’s so proud of himself. I also imagine Davis is laughing like that because he just set something very large on fire. Baby Skaerva!!!! X3 Sooooo uber cute!! Baby Derk is cute too. ‘poonis composed’ is Captcha today. Baby Derrrrk. HE SO SMOOTH. I can’t believe there was a time he wasn’t so hairy. Oh, for my fanart, is Skaerva’s outfit just a long tunic-like thing, or are those matching shorts? And does Skarvie have three fingers because he’s a shark-man or do all your characters have three fingers? Yeah, I know babies are often born with a head of hair, but actually I don’t have enough experience to know if they are born with body hair… all I know is if Derk came out looking like he does now, and I was him momma, I would be terrified. Everyone in Idenau has three fingers and a thumb because CARTOONS and that’s also just their genetics. Oh, okay. Great, thanks so much for clearing that shorts-tunic thing up for me. I feel less stupid now. And that’s cool how everyone had three fingers and a thumb, I’ll just have to make sure to be as… cartoonishly correct as possible in my fanart (I drew Lorelei with a normal human hand in Kelly Nelly’s birthday gift, so derp there). 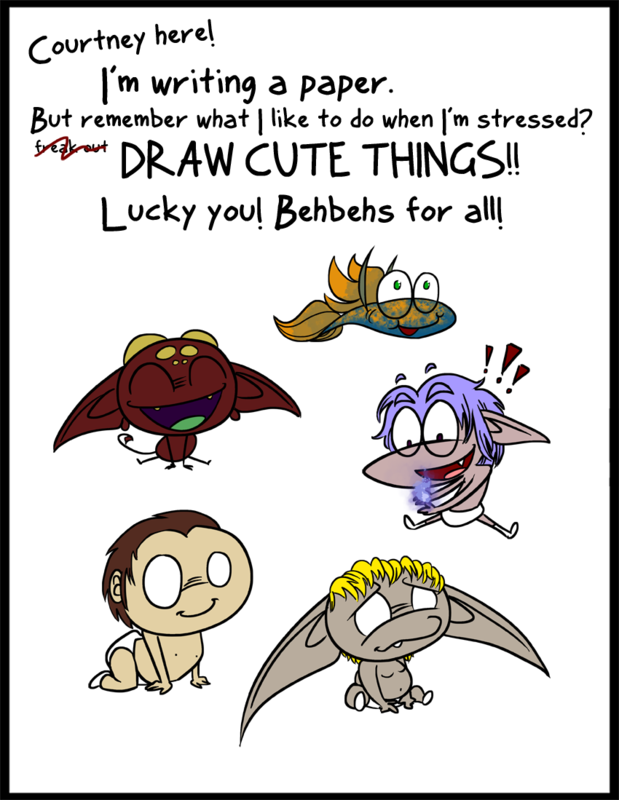 And thus starts the obligatory baby/chibi character spin-off. Pearl o- wait this no comic! No wisdom for U! Good. Babies could choke on your pearls of wisdom! Aww, baby Slice is so… exactly the same. Could be that this is actually a biography, not a webcomic, done with graphical content. You’re just hiding all of the magical worlds for yourself! … and that’s how he got his black eye. He was a fat little boy. He used to be so much less of a cool guy. Wittle baby Skarva is so delighted in his ability of magic. Poor davis w/out any Bowtie. And Poor Derk w/out any bacon. PS Good luck on your paper! Captcha is gedlewy collision. I just HATE it when my gedlewys collide, dont you? Thanks! I finished it. It wasn’t bad, actually, once I got down to writing. And Davis without his horns, and Derk without his hair! Its so sad, they are all lacking! “rartedr samewhat” Now the captchas are just mocking me. What happened here? It was babies before but now it looks like an alternative strip for the Frostbite Fortress arc. I will try to fix it, then explain. Thanks for the alert. Ok, it should have stabilized at babies now. A couple hours ago, I was going through the comic again, looking at my old art and how I’ve improved, when I noticed one of the Frostbite Fortress pages – which I’m sure was there originally – had mysteriously gone missing from the archives! I put it back, but apparently inserting something into the flow of older comics freaked the site out a little… huh. Let’s hope that’s the last of it. That’s very weird. I don’t recall ever seeing it though…perhaps it’s been missing for a while? Perhaps… I know it WAS up at some point, it must have been because we didn’t have a buffer at that point any more than we do now, so we couldn’t have skipped uploading it. It’s really upsetting, if it’s been gone for a long time. It’s not a particularly important page, thank goodness, but it does have some cute aspects to it and the one before and after it don’t really flow together naturally, as they shouldn’t. Baby Skarva checklist: (1) create magical fire (2) learn to use the potty. That was my checklist too, but I never got the first one down. I was forced to move on eventually. Pearl of wisdom: You should never say anything to a woman that even remotely suggests that you think she’s pregnant unless you can see an actual baby emerging from her at that moment. But that wouldn’t be fair, or feasible, budget-wise. I am made for the “cool geeky uncle/older cousin” role.